“The Farce is the spirit of the Nonsensical that surrounds us and flies up our noses. It is always with us, making normal situations ridiculous, making the straight path into a curly-cue. “Stretch out with your Humor, my young Padowan. You can feel the Farce every time you walk into a shop or get behind the wheel of your car. The Farce causes your brand of toothpaste to disappear from the shelves. It offers you 50 cevapi instead of 5. The Farce makes drivers believe it is ok to park at a red light. “The Farce is an energy field created by all ludicrous things. It opposes taking oneself too seriously. It always acts against the Shopkeepers in the service of the Consumer Alliance. “It is the Grumpy Jedi’s most powerful ally – but beware of the Dark Side. If you allow yourself to be caught up in circular logic with the Shopkeeper, the Stoplight Parker, or the Customer Service Representative, these lead to the Dark Side. “No good blogs can come of these. “The Farce can have a strong influence on the weak-minded. When you are in the grocery store, stand behind a fellow shopper. Wave you hand and say, ‘These are not the eggs you’re looking for.’ They will choose gummy bears instead. It is not forbidden to have fun with the Farce. 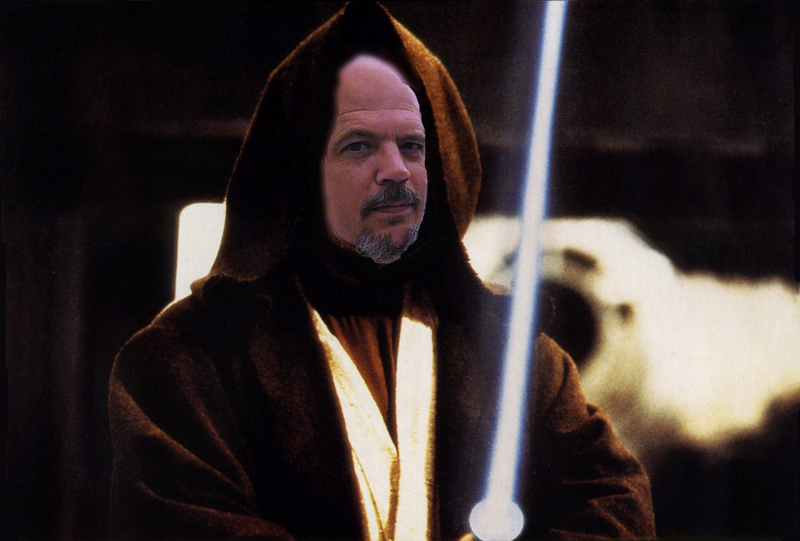 “A Grumpy Jedi’s strength flows from the Farce. But the Dark Side has a powerful appeal. Anger, fear, aggression, lawsuits, and nasty letters; the dark side of the Farce are they. Easily they flow, quick to join you in a fight. “Everywhere you are in Belgrade, you can sense the Farce. It is present when your waiter looks you in the eye but does not see you. It is in action when he brings your order after three hours. And it is there when he brings you a cheese-covered boot instead of a coffee. “The Farce helps the Grumpy Jedi to turn bad situations into Comedy. Without the Farce, the race of humans would long since have slaughtered each other in the check-out line at Maxi. “Rely on the Farce in moments of great need. But now I must conclude our lesson for the day. I must go to the post office. This entry was posted in Essays and tagged blog, Chris Farmer, consumers, Grumpy in Belgrade, parody, Shop Wars, shopkeepers, shopping, Star Wars, the Farce, the Force. Bookmark the permalink.